Please welcome Paul Crilley to The Qwillery as part of the 2017 Debut Author Challenge interviews for his adult debut, Department Zero. Paul: When I first moved to South Africa I bought Life the Universe and Everything, and The Colour of Magic to read on the plane. Those were the first genre books I’d read, (even though I loved Star Wars and other SF movies.) I started reading more and more and when I was 14 realised writing was what I wanted to do. Cue lots of bad writing and terrible half-finished novels. Paul: Definitely hybrid. I start off a book with the best intentions. I’m going to have the whole thing plotted. I’m going to do all the work before I even type Chapter One. But it never works out that way. I manage to plot out the first 30k or so, get writing, and then… nothing. Well, not nothing, but this is where I have to see where the characters take me. I mean, I have a vague outline. I know the midpoint and where I need to be at the end. But everything after 30k is pantsing. Paul: Pausing. Giving my characters room to breathe and develop. It’s a weakness in my writing that I’m trying to fix. I always want to keep going forward. Onto the next big scene. But I need to slow down a bit, I think. Paul: My biggest influences are William Gibson, Terry Pratchett, Douglas Adams, and Neil Gaiman. All those authors were read at a fundamental period in my writing development and I still feel their influence today. TQ: Describe Department Zero in 140 characters or less. Paul: God, you’re not asking much are you? It’s a multiverse portal fantasy with Cthulhu mythology, buddy-cop interactions, a single dad trying to do right by his daughter, and it’s snarky. Sorry. Didn’t quite make it to 140 characters. I think I’m 8 over. 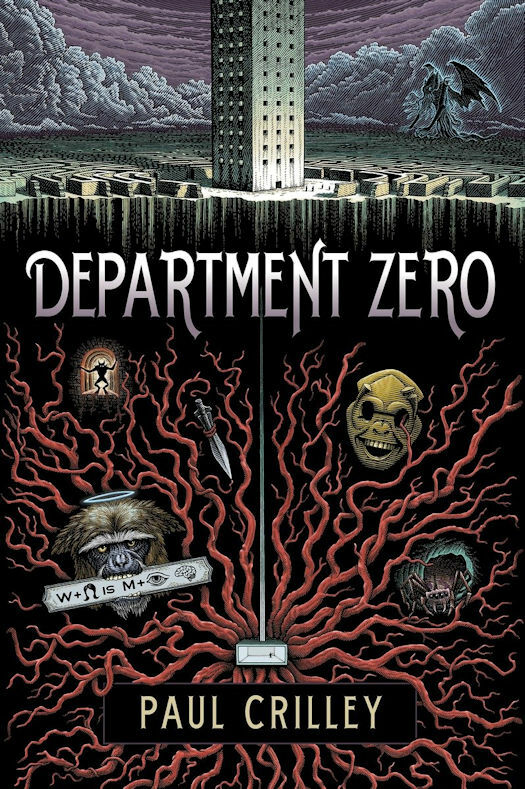 TQ: Tell us something about Department Zero that is not found in the book description. Harry and his partner Jorge stumble onto what they think is just another crime scene at an old motel in Santa Monica, and when Jorge steals some evidence form the scene, Harry finds himself chased down by Vervet monkeys with the faces of old men (that quote Shakespeare at him), spider monsters that eat your brain, various creatures from the Cthulhu mythology, and of course, the acolytes of the Old Ones. Unfortunately for Harry, Graves, as well as being arrogant, loud, and over the top, is also a big fat liar. The kind whose pants are on fire. His team was demoted to Department Zero after the incident at the motel, Department Zero being the lowest department in the entire ICD.) And what does Department Zero do? They clean up crime scenes. Of the supernatural kind. Graves wants to use Harry as bait to draw out the people that got him demoted, and this brings them into contact with a cult that worships Cthulhu and wants to free him from his prison in the Dreamlands. Cue lots of bickering, travel to alternate realities, battles, incredibly strategic and fast retreats, the Spear of Destiny, Robert E Howard-type fantasy worlds, and more bickering. TQ: Department Zero is your first Adult novel and a genre bender - Fantasy, SF, and Steampunk. How different is it to write a novel for adults? What appealed to you about mixing genres? Paul: I love writing for kids and adults. It sounds weird but there is a freedom to writing for kids. You can throw in more big ideas and concepts and they’ll accept them quicker than adults will. But I love writing for adults as well. It’s fun to deal with adult themes and get to swear a bit. Both are totally different and I’d do both forever if I could. As to mixing genres, I wanted to write a funny book that had all of my favorites tropes. Banter between characters set in the modern world, secret societies, fantasy worlds, Victorian England, mad chases, Cthulhu mythology, and… I’m sure a few other genres I’m missing. I wanted to bring them all together into one book universe so I could play around with anything I wanted. TQ: What sort of research did you do for Department Zero? Paul: Lots of reading about the Cthulhu mythology, the types of monsters HP Lovecraft created, the themes he explored. I wouldn’t really call it research, though. It was great fun. 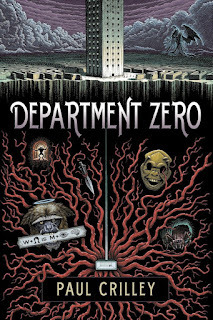 TQ: Please tell us about Department Zero's cover. Paul: I absolutely love the cover. The artist is Patrick Arrasmith and apparently he does all his work on a scratchboard. The cover does feature some easter eggs from the book, as well as easter eggs from an earlier version of the story where things had to be changed for copyright reasons. So if anyone figures that out, they earn points. TQ: In Department Zero who was the easiest character to write and why? The hardest and why? TQ: Give us one or two of your favorite non-spoilery quotes from Department Zero. Paul: A. I quite like the opening of a chapter when they go to an alternate London, where the War of the Worlds actually happened. So here’s the thing. When I set off after the guy who stole the spear, I really didn’t expect to end the night chained to an altar in the ruins of St. Paul’s Cathedral while my blood is sucked from my body by a group of insane (and unfit) cultists frantically working foot pumps in an attempt to bring the rotting corpse of a Martian invader back to life. But them’s the breaks, honey. The polite term for what I do for a living is “biohazard remediation”. That’s what I say if anyone asks me at a dinner party. Not that I’m ever invited to dinner parties. (Megan got custody of all the friends in the divorce.) But it’s what I’d say if I was invited, and if someone was actually polite enough to approach through the chemical smell of industrial-strength cleaning products that clings to my body. Another term for what I do is Crime and Trauma Scene Decontamination. Or CTSDecon, if you want to sound cool. Which, basically, means that I clean up stiffs for a living. All the stiffs. No prejudice in my line of work. Decomposition after unattended death? Check. Paul: I’m currently working on the sequel to Poison City, which is called Clockwork City. Poison City is out now and it’s the first in an urban fantasy series set in Durban, South Africa. It’s about Gideon “London” Tau, a man who works at the Delphic Division, a branch of the SA government that tackles supernatural crime. Paul: Thanks for having me. Harry Priest just wants to make sure his ex-wife doesn’t take away his visitation rights, and his dead-end job cleaning up crime scenes for the past ten years isn’t doing him any favors. But when Harry attends what he thinks is a routine death, he stumbles onto a secret multiverse of alternate realities all reachable through universe-hopping gates. Policing these worlds is Havelock Graves, the Interstitial Crime Department’s top agent for ten years running (according to him). When Harry accidentally messes with the ICD crime scene, Graves and his team are demoted as low as they can go: Department Zero. They’re recruiting Harry too—not because he charmed them, but because he just might hold the key to saving the universe . . . and getting their old jobs back. The team will have to fight its way through realities filled with Martian technology and evade mad priests (Harry’s favorite kind) in a realm of floating landmasses where magic really exists. And Harry has to do it all in time to say good night to his daughter. Harry Priest, the main character in Paul Crilley's adult debut, is in a dead-end job as a crime scene cleaner. He's divorced and the highlight of his day is calling his daughter each night to read to her before she goes to sleep. His relationship with his ex-wife is strained. He's been a disappointment. After being called to a crime scene site to clean up, Harry and his boss's son stumble upon something that they are not meant to see. Things go downhill from there or perhaps uphill depending on your point of view. Harry is recruited into the Interstitial Crime Department (ICD) by Havelock Graves. Graves is a larger than life self-aggrandizing agent who nevertheless gets things done. Harry thinks he will achieve his dream of fighting crime. He had wanted to be a policeman. Instead he's on crime scene clean up again with Graves and Ash (a team member of Grave's) in Department Zero, the most lowly department of the ICD. Graves wants his old job back in the top echelon of the ICD having been demoted because of something that Harry did before he was in the ICD. This sets up a rollicking adventure for Harry and Graves as they travel the multiverses to save the everyone and everything. Crilley does a wonderful job describing each of the multiverses and layering in much of the Cthulhu Mythos of H.P. Lovecraft. The inner workings of the ICD, how its agents travel between multiverses, and the multiverses themselves are well drawn. It's quite easy to picture each of the distinct places to which Harry and Graves travel. There is a lot of humor in Department Zero - laugh out loud humor. Harry is wonderfully self-deprecating, funny and snarky. He seems to get himself into sticky situations with regularity. After all, he is new to the whole multiverse thing. Graves may be a buffoon at times but he is a fabulous agent. Harry and Graves make a very odd but wonderful team even though Harry wants to punch Graves with some regularity. Crilley uses the Cthulhu Mythos to great effect in Department Zero. If you are a reader of Lovecraft you will recognize many of the Old Ones, references to the Dreamlands, and more. Crilley's take on how to wake Cthulhu and its consequences is fun and interesting. As a longtime fan of of the Cthulhu Mythos I really enjoyed that Department Zero is grounded in Lovecraft's mythology. And if you aren't familiar with Lovecraft's work (and those that wrote more in the Mythos), Crilley does a great job of explaining everything so you will not miss out at all. Department Zero is not just fun, shooting strange beings and trying to save the world, it's also a personal journey for Harry. Being faced with death and destruction at every turn makes Harry think. He realizes things about his life, his former marriage, and who he wants to be during the course of the novel. He's really a good guy. While Graves is jaded by all he's seen, Harry is enthralled by the odd, the weird and the fantastic. Department Zero is an exuberant ride through the multiverse. It's a spirited fantasy adventure with strange beings and worlds, nail-biting thrills and great humor. Paul Crilley is the author of The Osiris Curse and The Lazarus Machine. Born in Scotland in 1975, he moved to South Africa when he was eight years old. He was rather disappointed to find out that he would not, in fact, have elephants and lions strolling through his backyard. He now lives in a small village on the east coast of South Africa with his family. He writes fantasy, Young Adult, and Middle Grade books and also works in South African television. He spent a year as part of the writing team for the computer game, Star Wars: The Old Republic, and also writes comics when he can get a chance.